Can you give as a working sample for Xafari Server or if not a guide as to how to use it in an existing XaF app. We can provide you with a simple XaF project we have as startup in case you need some code to begin with. A working example there is in the sample solution Xafari.Northwind.DC which is installed in the folder “%PUBLIC%\Documents\Xafari Framework v14.2.507 Demos\Northwind.DC\CS” by the Xafari Framework Installer. One of the major advantages of using Xafari.Server within Xafari.Reports is asynchronous reports generation. You can see an example by starting demo application “Northwind.DC Web”. When the application is started you have to deploy sample reports by clicking on the action "Deploy demo reports" (see #1 at the screenshot below). 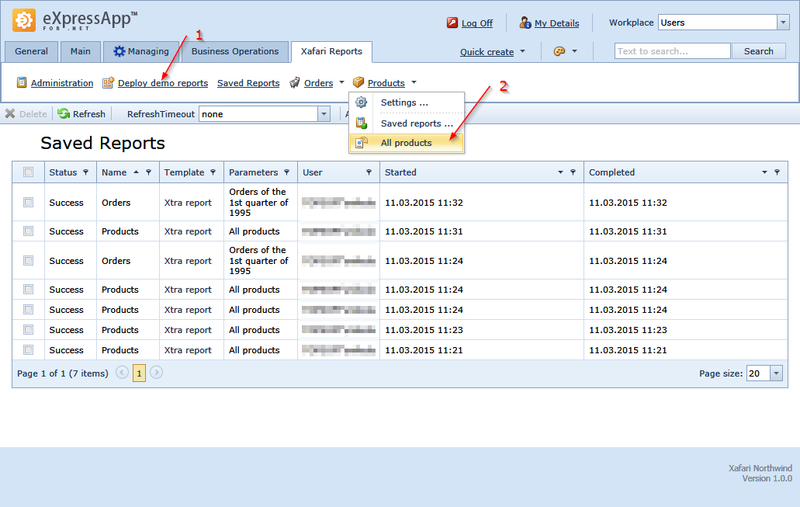 After that click on the action "All products" in the drop-down action list “Products” (see #2 at the screenshot). A window will appear with the message “Report sent for processing, the result will be displayed in the log reports”. Thus the report is generating in the background, while a user can continue works in the application.